I did some googling around and discovered the image came from a Yankee Magazine craft idea. That means you can see the image for yourself and have directions for creating the "Photo in a Bottle" project. Take a quick look at this project. I think you will love it. Let me know what you think of this craft and if you love it as much as I do. MILLS, M.A. 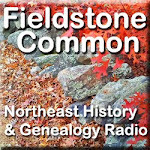 (August 20, 2012) – Professional genealogist and house historian, Marian Pierre-Louis has developed a new history and genealogy radio show called Fieldstone Common. The live 60-minute show will feature authors, historians, curators and others whose passion is to keep New England history alive. Shows will be broadcast through Blog Talk Radio (http://www.blogtalkradio.com/FieldstoneCommon) and made available afterward via podcast. The schedule and announcements about the show can be found on the Fieldstone Common blog. The inaugural episode airs on Friday, August 24, 2012 at 1:00pm EDT. The show premiere will feature Paul Della Valle, author of Massachusetts Troublemakers: Rebels, Reformers and Radicals from the Bay State. A few months ago while talking to the Houstory Publishing guys about their house history book they told me about a new service to track heirlooms. While on vacation this summer with my family, my Dad gave me a family heirloom that came from his mother. Finally I had the perfect item to test out this new service. 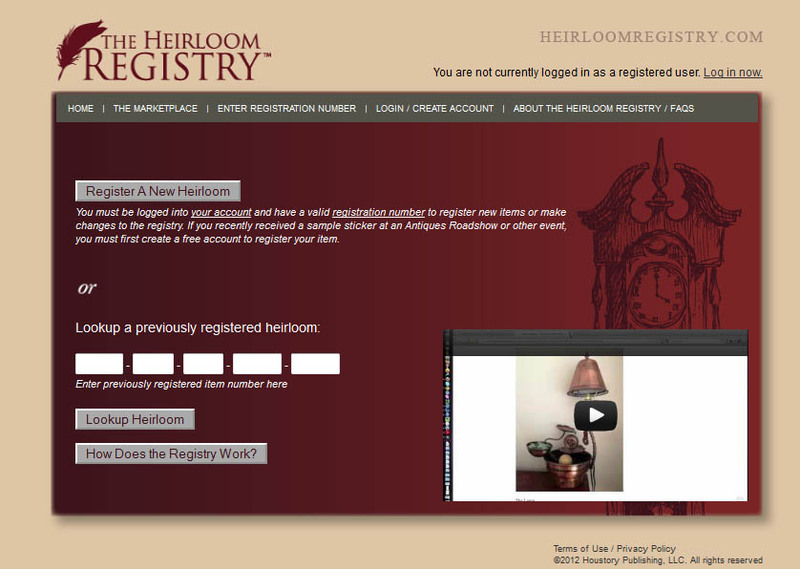 The service is called the Heirloom Registry and it's meant as a way to create a record about individual heirlooms which can be stored on the internet and thereby preserved and accessible to other family members. The process starts with a card that has a sticker with a registration number on it. The sticker gets attached to the underside of the heirloom. 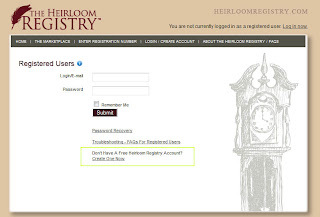 Then you go to the Heirloom Registry website to register the heirloom. 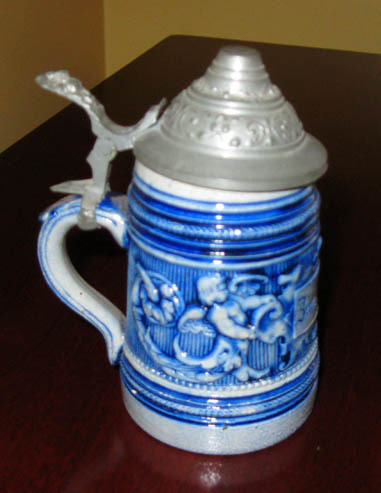 My item was a beer stein which my father told me had been given to his mother from her father during the year that they lived in Germany. My great grandfather, James Quayle Dealey, had been a professor at Brown University and apparently he was a visiting professor in Europe for a year. This was my first time visiting the site so I didn't already have an account. I had to select "Create One Now" from the options on the next page. It was in fairly small type so I have highlighted it in yellow in my photo to show you were to find it. The account creation was very simple and non-intrusive. I was asked for an email address and a password. No other personal information was required. 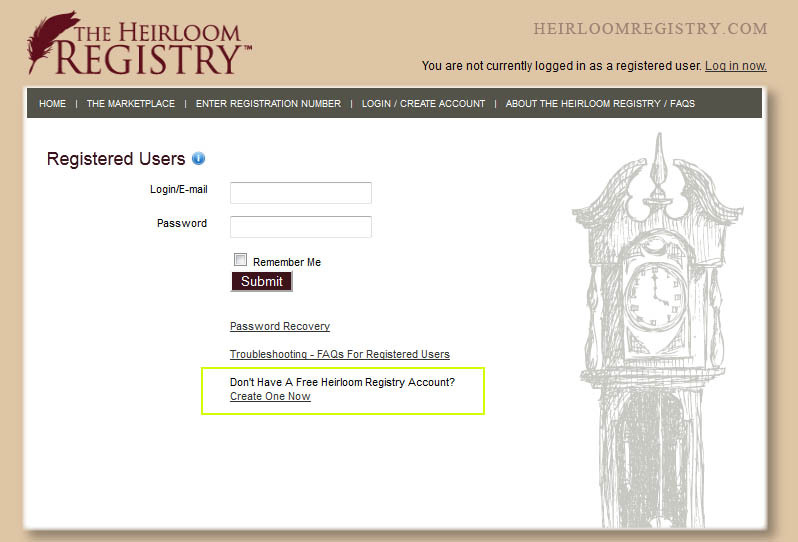 On the next page I selected "register a new heirloom." Then I entered the number from the sticker I had. 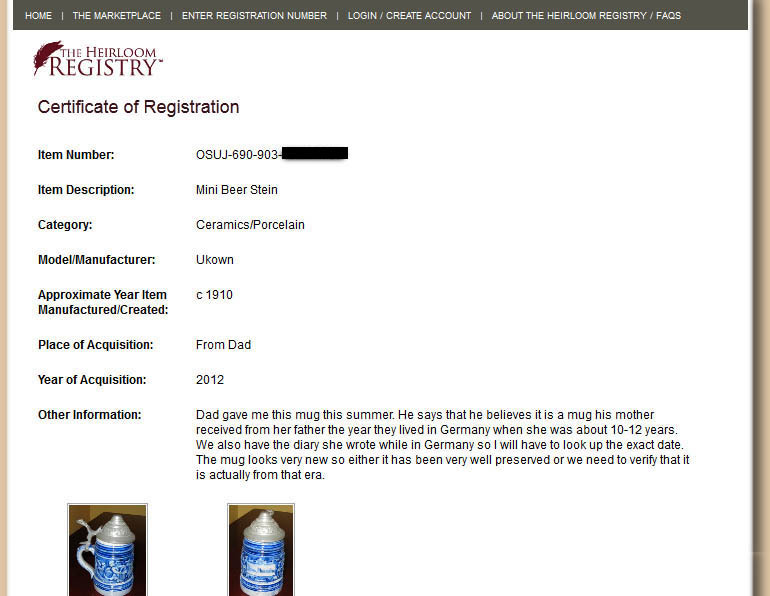 This brought me to the main page for heirloom registration where all the information is gathered about the item. I filled in an item description, selected a category for the item (in my case, porcelain), filled in the creation date. I didn't know who the manufacturer was so I put unknown. I was also able to add photos and fill in a lengthy description. After everything was completed to my liking I hit the save button on the bottom of the page. I was able to print a certificate of registration. I was very pleased to see that the certificate had a nice layout and clean printer friendly design. Bad design can ruin a product for me so I was happy that they paid attention to this detail. 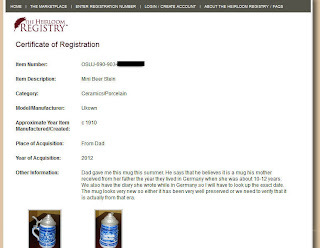 The certificate of registration can be printed and added to an heirloom archive or even to will and estate papers. I could imagine that a person could even include in the description who they want the item to get passed down to (though I wouldn't think that is legally binding). 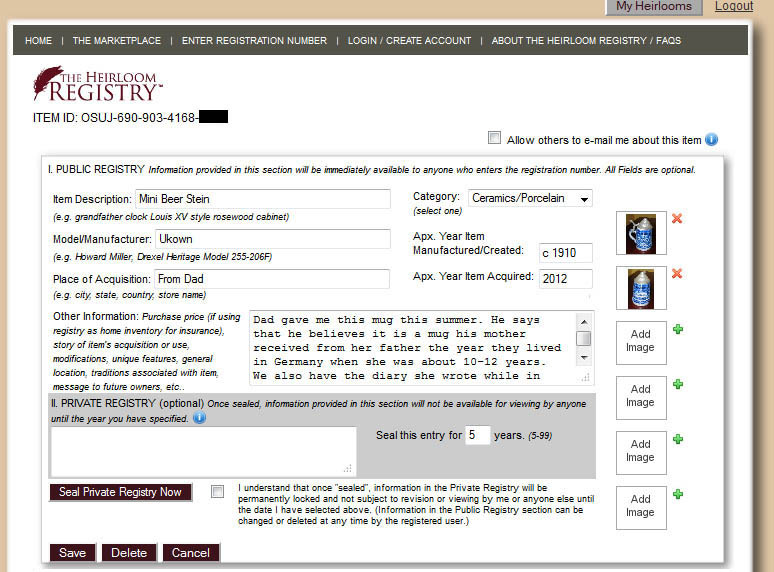 Keep in mind that the registry description is publicly available to anyone who has the registration number. In theory, no one would see the number unless they picked up the object or were given the number by the owner. 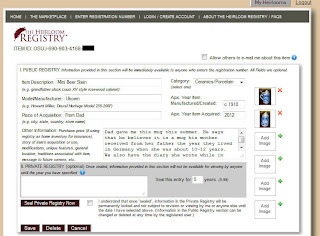 There is, however, an option to seal the information from public view (see data entry photo above) which can be for a pre-selected number of years. Overall, I found using the Heirloom Registry a very quick and simple process. I like the idea having a catalog of family heirlooms that can be accessed via "the cloud" from any computer. I could also see this being be particularly useful in insurance claims in the case of a fire or robbery. I was impressed by the Certificate of Registration printable page and the encouragement that it should be printed out and preserved. I had a good experience with this service and look forward to adding more heirlooms to my account. When I look back at my career as a professional genealogist and house historian there are many practices and habits which I wish I could have done differently from the start. There are two ways you can learn: from experience (i.e. the hard way) and from the advice of those who came before you. Here are two tips that will get budding professionals on the right track if they start from the beginning. I know, you are thinking, "Is she serious?!!" Yes, I am absolutely! There are many tracks you can follow in genealogy. You can focus on client research, you can be a speaker or a writer. Very likely you will probably do a little bit of everything. Copyright is a huge issue for all professionals but genealogists are particularly sensitive to it. If you start taking your own photos right from the beginning you will build a large resource library where you don't have to worry about copyright (except perhaps someone stealing one of your photos!). In the process you will save a lot of money by not buying stock photos and you will save a lot of time by not scouring the internet for public domain or creative commons photos. Consider this - the more advanced you become in your career the greater the need you will have for photos. Your PowerPoint presentations will need to have photos to liven them up. If you have a blog you will have a constant need for a steady photo supply. Even writers benefit from being able to supply their publishers with relevant photos. Client reports benefit from the addition of gravestone photos, historic house photos or other items relevant to the research project. Get in the habit of taking your camera where ever you go for work. Take photos of the repository and archive buildings that you visit. That will prevent the temptation to "borrow" one from their website. Take scenic snapshots of geographic areas that your research focuses on. Take photos that relate to your specific niche. You will amass a large collection of photos if you get in the habit of carrying your camera with you at all times. It will only take a matter of weeks before catching up with your backlog becomes overwhelming. Many photo programs import photos to your computer by date. That's how mine are organized. Occasionally I have taken the time to label a folder by event and/or year. Most of the time I am in a hurry to clear space on my camera so I dump the photos and continue shooting. I've got a right mess on my hands! I know what photos I have taken but I can't always put my hands on them when I need them. This is a problem when you are in a crunch to create a PowerPoint presentation or to finalize a blog post. To fix this problem you need an easy drag and drop tagging system. Geoff Rasmussen did a great webinar about organizing photos. He talked about the free program, Picasa and Adobe Photoshop Elements which can cost in the $60-99 range. I got Picasa right away but wanted something more robust for organizing my photos. I'm working on a number of projects right now that involve collecting and organizing lots of photos. I've been getting so frustrated by my inability to put my hands on the photos that I have. So I bit the bullet and bought Photoshop Elements today. As soon as it arrives I'm going to spend an hour or two every day to get my thousands of work related (and personal) photos tagged appropriately. It doesn't matter what system or program you use to organize your photos. The important thing is that it works in such a way that you can put your finger on the photos you need in three minutes or less. If it takes longer than that you might want to consider revising your sytem. There are many things that can get you headed in the right direction as your begin your professional career. Photos are just one example that can create a backlog later. Get a handle on them now and get yourself off to a great start. Why I Love Tom Jones Even More Now! Recently I picked up a CD of a workshop called "Seeing the Forest AND the Trees (and Their Leaves): Mastering the Craft of Genealogical Documentation" by Dr. Thomas W. Jones. 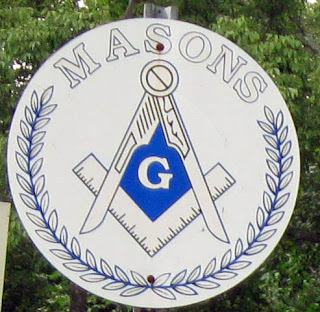 I have to admit that I had the chance to see the presentation live when Dr. Jones came to Boston to present it to the New England Chapter of the Association of Professional Genealogists (NEAPG). I didn't or couldn't see it at that time. Nor did I take advantage of purchasing the CD when it first came out. I dragged my feet. You see the topic is citations. I have a love-hate relationship with citations. I love to find them and use them when I am doing research and reading but I don't find joy in creating them myself. I ran into Kate Lowrie, the president of NEAPG, recently and she just happened to have an extra copy of this CD on her. The time had come for me to take a step forward and watch it. Interestingly enough, I popped the CD into my DVD player and watched on my widescreen smart tv. I'm not sure if everyone can view these on their tv but give it a try because it was a phenomenal, comfortable way to participate in the workshop. I was blown away by this workshop! I admit that I was worried that this workshop might be a bit over my head or perhaps too academic. As one of the premier genealogists of his generation, I was a little afraid that Dr. Jones would leave me in the ether. I couldn't have been more wrong! In this workshop Dr. Jones SHINES as an educator. The result is an appropriately paced, step by step workshop that helps the viewer build on their knowledge as they progress through the workshop. My admiration soared. He took his brilliant knowledge and blended it with his skills as a teacher and the result is a strong, helpful learning tool for all genealogists. I had heard from the live attendees that there were a number of exercises. I admit that I was worried about whether I would be able to do those well. I shouldn't have been. Each exercise was a learning tool that built upon the previous lesson just learned. This step by step approach was gentle and empowering. Even beginning genealogists would be comfortable following along. Yes, I could gain this information from reading a book but this was much easier for me. And hearing side explanations about certain abbreviations or why formats are done in a certain way cleared up and broadened my understanding of creating citations as a whole. I'm not sure that I love writing citations any more but Dr. Jones' teaching has made me less fearful of them. Before I glow too much I will share the two negatives I found with the CD workshop. I admit that I did not love green as a choice for the slide presentation color. And occasionally the sound got a bit wobbly (but that could have my equipment, I can't be sure). That's it. The rest was well done and effective. I can't tell you if you need this CD or not. Everyone is at a different stage in their genealogical education. For me, it was worth the price and I will likely watch it several more times. I think it is appropriate for beginner and intermediate genealogists as well as anyone wanted a refresher on citations. Author: Dr. Thomas W. Jones, Ph.D.
Disclosure: I am a member of NEAPG but I have NO financial interest in this product. Recently, I have been getting a number of requests from society members or officers asking if they can show my Legacy Family Tree webinars on CD at their society meetings. If you want to show one of my webinar CDs to your membership, just shoot me an email and let me know the name of your society and when and what you'll be showing and I'll gladly say yes. I would ask that if you share the handouts with the attendees at the meeting that you make only enough printed copies for those in attendance. Please do NOT share the handouts via email or the internet. Other than that I hope you'll consider letting your members know about this blog (http://RootsandRambles.blogspot.com). Thanks everyone for all the emails.I am so glad that you considered my webinars as a program for your society! Here's a link to the full list of recorded webinars. There are so many great webinar offerings these days that I thought I would provide a roundup of all the individuals and groups providing webinars. Some charge a small fee for webinars but many are free. Either way it's a great way to get some tips and to jump start your genealogy. 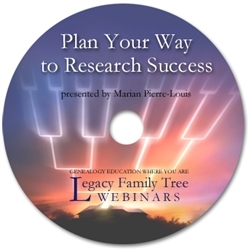 Legacy Family Tree Webinars - They provide genealogical webinars nearly every week. Their usual time slot is Wednesdays at 2pm EST but they also do some on Fridays and other times. The webinars are free when viewed live and for 10 days afterwards. Viewers have the option to purchase CDs of the webinars. Family Tree University - They provide live and on-demand webinars as well as a fall and spring virtual conference chock full of webinars. There is a fee associated with these webinars so check for the prices though discount coupons are frequently available. Follow them on Facebook or Twitter for the coupons. Webinars are held at varying times. Dear Myrtle - Dear Myrtle has been right there at the forefront of webinars since they began to take hold within the genealogy community. The Dear Myrtle webinars are free and the upcoming schedule can be found on the Dear Myrtle blog and on the GeneaWebinars Calendar. Archived webinars can also be accessed from the Dear Myrtle site. Michael John Neill - Neill, the author of Casefile Cluse and Genealogy Tip of the Day, regularly holds genealogy webinars. His archived webinars are available to buy via download. There is also a fee for the live versions. Find notices of upcoming webinars on his Rootdig blog. Illinois State Genealogical Society (ISGS)- Societies are getting in the swing of providing great webinar content too. ISGS is presenting webinars every month and they publish the full-year calendar in advance which is great for scheduling. Webinars are held the 2nd Tuesday of each month at 8pm Central (9pm EST). The live webinars are free but replay is only for members. Access to their webinar library may be enough to convince you to join! Southern California Genealogical Society (SCGS) - Pioneers in the webinar arena, SCGS was the first society to offer webinars to their members and the public at large. Called the Jamboree Extension Series, they also publish a full year schedule in advance. Their live webinars are free but membership is required for the replays. Webinars are held twice a month on the first Saturday at 1pm EST and the 3rd Wednesday at 9pm EST. Association of Professional Genealogists (APG) - APG has begun catering to the needs of its members by providing business focused webinars. The topics might also be of interest to genealogists in general or people who are considering becoming a professional. The webinars are free to watch and the replays are available in the members only section of the website. See the GeneaWebinars calendar for individual webinars by APG or look for press releases on the APG website. Friends of the National Archives - Southeast Region - This is another regional group that is providing a full year slate of webinar content. The topics tend to have a more southern focus but some are general interest as well. The webinars are free to watch live but membership is required for later viewing. You can view the full schedule of webinars by ALL genealogy webinar providers at the GeneaWebinars site. If you know of any other webinar providers that I have missed please let me know so that I can add them to the list. What is networking? And is it worth the effort? I was in a discussion recently with some other genealogists and the subject of networking came up. Some wondered if networking was worth the time and effort. Regardless of whether you are a hobbyist or professional genealogist, do you feel that networking helps your genealogical research? What form does it take (in person, online, society meetings, etc)? Do you feel it's just a waste of time and you should focus on your own distant cousins or dirct work colleagues? Which do you feel is more important, advertising or networking and why? I am really interested in hearing what everyone has to say on this topic! You probably already know this but I value networking a lot. For me, it is something intuitive that I can't really help doing. I learned it from my mother. She loved networking too. I don't know where she got it from. I like to meet people who have a similar interest in genealogy or history. I am not looking for anything specific when I start networking. I am looking to build relationships. I'm in it for the long haul. Networking might reap a reward for me in six months, five years or not all. I also love the chance to help people. If I can do any action, small or large, to help someone I will try to do it. Likewise if I can connect two people who will benefit from the connection then I like to do that too. Networking allows me to meet people either in person or online. That allows me to help them and maybe someday they'll find a way to help me too. Networking also enriches me. I meet the coolest people through social media and face to face. Sometimes they have a different expertise than me or sometimes they have had some really cool life experiences. Meeting them and learning about their lives broadens my understanding of the world and increases my capacity to interact with more people because it opens up a whole new subject matter for me. I guess what I'm saying is that networking is both building relationship and increasing my education all that the same time. A perfect combination for genealogy I think! Networking has helped me professionally. Some of my best opportunities have come from professionals and non-professionals that I have networked with. Likewise, I like to share professional opportunities with people who have taken the time to build a relationship with me. What form does a relationship have? It might be Facebook, Twitter, Google+, society meetings, professional meetings, socials, email, phone calls, etc I have met people in person who I established relationships with on Twitter and other social media. They have become an important sounding board for me. I also strongly believe in advertising but I don't spend much if any on it (right now). At the moment I'm satisfied with networking. Each individual likely has their own strong preferences and comfort level with networking. I realize that though I am comfortable with it, many people aren't. My brother, for instance, is much shyer than me. At one point in his life when he was searching for a new job he had to force himself to become more comfortable with networking. I think today, he would say that it is a valuable activity. But it took him a lot of hard work to get to that point. So tell me what you think - thumbs up or thumbs down to networking and why? This is the second in a two part series following-up on my post about Action Lists. "When you return from a research outing where you have used one of these lists that contain multiple projects, do you end up writing multiple reports? I realize you would need to write multiple reports for different clients. How about multiple reports to yourself, if you have several projects going?" For me, the answer is a not so simple as yes or no. The Action Lists mostly represent record pulls. When I'm doing in-depth research such as on brick walls, I will do analysis on the spot. When I'm doing record pulls, I will likely glance over the records to see if I have a gold mine of information in hand but will hold analysis for later. I mention this because a written report is usually based on analysis. Since my Action Lists are simple record pulls I may or may not be doing analysis right when I get back to the office. I'm sure some professionals are gasping at this admission! My Action Lists can contain research for a myriad of projects such as client research, personal research, research for friends, background research for articles and background research for talks. The Action Lists help me to save time by pulling a whole slew of records all at one time in one trip. My schedule then dictates which projects I will be able to work on first. Client projects with deadlines will be dealt with first. Personal research may wait a week or a month. It's true that I could further my personal research by doing on the spot analysis thus allowing me to continue the hunt for more records. But my time is limited and I need to prioritize so that all the important information gets pulled first. With active, high priority research such as for clients, analysis of what I've found will be done right away and multiple research reports, if necessary will be written. When it comes to background research for articles or talks I often like to do a survey of a certain type or time frame of records. I may pull 10, 20, 50 or 100 records to get the background information I need. For these I am not writing reports. I will, instead, be analyzing the records for trends or other information that I can use in the talks or articles. When the time comes to look at the personal research, yes I will be writing multiple reports. I like to keep my genealogy tight and focused. I tend to write specific reports covering one objective or question rather than a broad topic. For instance, I wrote a personal report about what I found in census records for my brick wall immigrant ancestor, William Edwards. I might write another about surveying passenger list arrival records. Later on I would write a separate research report of my overall analysis based on the sum total of the previous research reports. Many researchers often put this all in one report but I stay more focused and less overwhelmed if I break things down. Again, I'm not saying that my approach is the best approach. It is simply what I have found to work for me based on my personality, work style and time limitations. The other day I wrote about Action Lists as a way to help keep track of "some-day" research that needs to be done. I had two very interesting follow-up questions that I would like to address here. One person asked on my Google+ wall, "Am I assuming correctly that you also keep track of what you have done [when using the Action Lists] as taught in your webinar?﻿"
This person is referring to my "Plan Your Way to Research Success" webinar where I created data completion sheets to make sure I gathered all the important information in pre-printed fields. The answer is yes and no. I don't always use data completion sheets (ie forms). How I capture the information is not as important to me as what I do with it. When I do on-site research I will try to determine ahead of time how I can capture the information that I find. In some cases I can use a camera or scanner and in other cases I'll have to transcribe the information. Since my Action Lists are repository specific I usually know ahead of time if I can scan items or if I'll need to transcribe. Much of the time I can scan or photograph and therefore bypass having to use forms. Ideally, I would like to get scans or photos of all genealogical information. That way I can view the information I accessed as I first saw it. That helps remove the chance that I've introduced errors while transcribing. The capturing of data for me can take these various forms but the filing of data remains consistent. I'm not sure if I discussed this in the webinar or not. I am not a paper person so I really don't keep paper files (I will lose them!). All of my information whether handwritten transcriptions, photographs or scans gets put into a project specific directory in my computer with a long descriptive filename. The longer I have been researching the longer my file names have become! I try to put all the basic citation information (file number, document type, town, county, date) in the filename in an abbreviated way so I can easily search my files without having to open documents. NOR = County where the document is held (in this case Norfolk, MA). I may include state if the location is outside my normal research area. I have seen some researchers put in full citation information and microfilm numbers in their file names. I'm not saying that my system is best. It's just what works for me. Please come up with a system that works best with the way you think. Ok, I know some of you are thinking, how does she get those handwritten transcriptions into the computer?!! Most of the time, unless there is a very good reason, I will scan my original notes and capture them as a pdf or jpg. That way I can save time by not retyping them and I don't have to worry about introducing further errors. Ideally, when using the forms as in the webinar, I would type directly into the forms on a laptop or netbook (or some would use an iPad). My laptop is too heavy and I don't have a netbook yet so believe it or not I still take some handwritten notes. Typing directly into the forms saves the most time by completing the task only once. There is still room for error when typing but it's the best option. I've been way too long winded in answering this question so I am making this a two-part post. I'll answer the second question in the next post. Let me know what you think of my process or if you have suggestions for improving it.